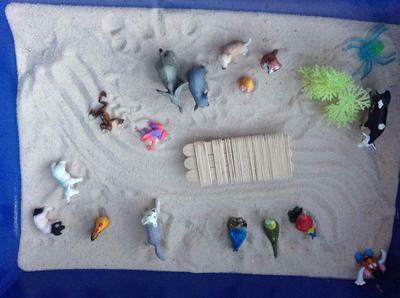 This sandtray for sand tray therapy class represents the arrival at camp in North Carolina. I first placed the bridge because I see this time as a transition into vacation mode, an opportunity to relax and connect with nature, but also a time when I spend apart from my family which is a transition for us because we do spend so much time together. The man with two dogs represents my husband who is home with our dogs. The larger one is serious and more wolf like while the younger pup is playful and happy. He is having to be tough with them because both dogs got loose on a walk and actually tried to attack a small dog walking by. Ironically, the larger dog is more representative to me of our small dog who is the alpha dog and more aggressive while the other is the younger, happier dog just doing what he is told by the other. It is likely at the back of the tray because it is something I really don’t want to think about but still pressing it’s way to the forefront of my mind. I chose the farm animals because all of my children are going to spend a wonderful week connecting with animals and nature at this camp where baby pigs and chicks are born and they get to be involved in the caretaking of these animals. They are young and innocent and my three children, while not together, are represented by the animals closest to them. The blue bird/parrot represents my oldest who is surely soaring this week. He and his younger brother look forward to camp year round and this is a time when he shines. He gets to be in the wilderness being active but also connecting with friends, putting on skits, and singing songs. It is such a peaceful and wonderful opportunity that he is able to return each year and grow in these amazing, challenging, and beautiful experiences. The little lion cub represents my ten year old son who is also ready to play but likely starts out a little cautious at camp. He will make a few close friends and enjoy his time, hopefully. If not, I know there will be a sad roar that comes out at the end for a missed opportunity, which once he experienced at camp. I place him here closest to the animals hopeful that his time will be playful and fun and that he won’t need to roar. The small pup represents my little one who is innocent and excited but also a little anxious about her week at day camp. Her good friend is the frog who seems ready to leap into the fun and is confidently leading the way. I hope my daughter is also ready to jump in and have fun. I am the elephant and the sleepy person looking toward this week for my children but also with my own stories. I am staying with a friend and sure to share parts of myself with her throughout the week as we get to know one another better. I am also very tired from a busy year and ready to spend time recuperating and focusing on caring for myself. 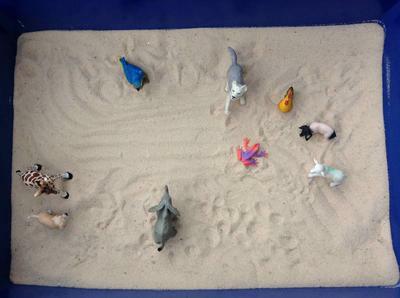 The cow was intended to be present just as another representation of the animals on the farm. It was the first thing we saw as we drove the boys in to camp, so in that sense in the forefront of my experience thus far in the mountains. The spider is a representation that we are in the mountains surrounded by bugs and especially spiders that are a part of nature but can be a danger. We are also surrounded by nature, represented by the trees. 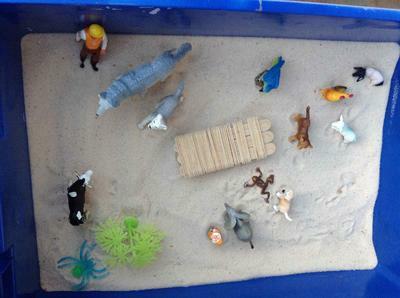 I return to write about yesterday’s sand tray for my sand tray therapy class. It is full of all the relationships at the forefront of my mind, surrounding me presently. I removed the bridge though returned it to it’s place because I am still in transition into the mountains and this refreshing mindset, hopeful it will continue to clear my mind and bring peacefulness. It is still hard to relax and completely let go to be more at one in this new place. My boys are still in their place enjoying themselves and others and the return to camp. My daughter has now changed places with her friend and is going together excitedly to join in this new experience. She is joyful and ready to have a wonderful time and confident to be herself. She is moving a little away from me as she grows in this place where I feel safe to let her roam . I am still tired and seeking rest. I still have a story to tell but am remembering that I am a kind and motherly person, the koala, inside and cautiously letting my family find themselves so I can let go a little and focus inside. I also have my friend who has been the meerkat today and her pup whom I spent the day listening to her stories. This is both a distraction and an encouragement. And my husband is Mr. Potato Head, changing though I’m not sure how. It is really my perception of him as becoming more accessible, helpful, and even independent in a way that may allow us to reconnect. Today I removed the bridge. As I sit on the deck and feel as if I’m in the clouds, I’m allowing myself to relax and soak in the beauty and peacefulness. I left myself as the elephant, knowing I have my own story to tell but not sure of exactly what I want it to be, though ready to figure it out. Now, I am alone and centered and peaceful, separate but connected still. 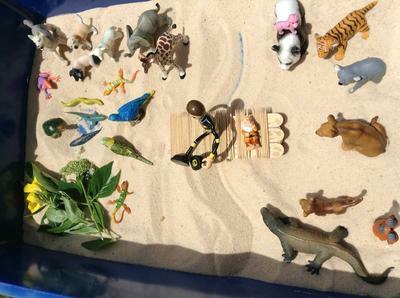 My goal is to get the sandtray down to myself so I began today by removing those figures representing the people around me though I left those of my family because I feel the connection is strong and they are a part of who I am and in my constant thoughts. My oldest has stayed the bird but having felt the comfort of being surrounded by friends is now ready to soar on his own. My middle child is still the playful pup, joyfully with the animals and facing my daughter, welcoming her to Gwynn Valley. She is the pink and purple frog jumping into this new world, feeling more confident and sure of herself. She feels welcomed by her brother and a new connection with them as well. They are all further from me but still close. As the elephant I can look on from afar and be a calm and sure presence for them to return as they wish. My husband is moving forward in the tray, closer to be though still separate. Physically he is still caring for our home, the dogs represented together now in one pup as being innocent and in need of our guidance and care. Now my husband is represented by the young giraffe, sticking his own neck out to be a part of our family but still young in being sure of himself and knowing who he is. If this tray represents parts of myself, I see the elephant as sturdy and strong but still growing and learning every day, being an onlooker and a source of strength and peace for my family. I am the giraffe learning how to be brave and unknowing. I am the puppy in my infancy learning to deal with change. I am the bird who wants to soar and is beginning to let myself fly. The frog, timid but willing with a little encouragement to join others, and the pup playful and encouraging. In the animals of the farm, I have been the mother pig waiting to give birth, the mother hen guiding and directing my family, and the small lamb, weak and shy when I was young but growing stronger every day. The only thing missing is more of nature so I will go and find elements to bring into the tray today.